Have you ever looked in the mirror, and thought ‘Hmmm, my teeth aren’t looking quite as good as they could’? If you have, we are here to help. Feeling unhappy about your teeth can really affect your confidence. Fortunately, there are a whole range of things we can do to get your teeth looking fantastic again. It could be as simple as tooth whitening, or as involved as a full smile makeover, this could be complemented with a course of Facial Aesthetics. Complexion, colouring and facial structure all play an important part when creating a bespoke, natural-looking smile that’s just right for you. If you’d like to know more, read on, or why not request an appointment? Modern life means sometimes things we eat or drink stain our teeth and make them look less white than we would like, there is a solution. Tooth whitening can be a very effective way of lightening the natural colour of your teeth without removing any of the tooth surface or damaging it. Usually the original shade of the tooth is whitened to a lighter colour, rather than being turned completely white. Teeth whitening can either be done in the dental surgery or at home. 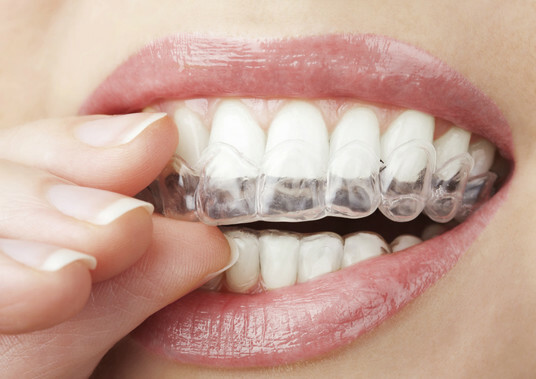 Home whitening uses custom-made trays which are designed to fit your teeth precisely, allowing a whitening gel to remain in contact with your teeth. These trays are made at the lab after your dentist has taken impressions of your teeth. The teeth whitening process involves wearing the gel-filled trays daily for a few hours a day for approximately two weeks. If you’d like to talk through this service, why not request an appointment? Dental Implants are titanium screws that are placed within the bone in order to provide a stable support onto which replacement teeth can be mounted. Whilst we do not place implants at Bridge End Dental Practice we have trusted specialists to whom we can refer your care. Nobody wants a smile with gaps, replacing them with a durable solution will help restore your confidence. Tooth loss can also affect how well you chew, and what foods you are able to eat, as well as altering the way your teeth meet. Implant supported teeth are the closest thing possible to natural teeth, providing a long-term solution to your dental problems. They can be placed without impacting other healthy teeth unlike certain bridges. They are also fixed in place, and aesthetically are more pleasing than dentures. Implants are often placed under local anaesthetic by making a small cut in the gum and the implant placed into the bone, this is usually not painful. The gum is then allowed to heal and the bone to integrate around the implant. Once the implant is fully integrated, a mould is taken to create a custom-made abutment designed for your tooth, after which a crown is fitted to resemble your missing tooth. Veneers are a great way to close spaces, mask staining or improve the appearance of your teeth. A veneer is a thin layer of porcelain made to fit over the front surface of a tooth, like a false fingernail fits over a nail. Sometimes a natural colour ‘composite' material is used instead of porcelain. Veneers are extremely thin, but once bonded to the tooth they’re very strong and durable. 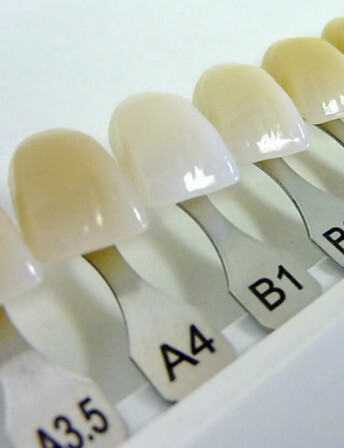 A precise shade of porcelain can be chosen to give the right colour to improve a single discoloured tooth or to lighten your front teeth. A veneer can make a chipped tooth look intact again. The porcelain covers the whole of the front of the tooth with a thicker section replacing the broken part. Veneers can also be used to close small gaps, when orthodontics (braces) are not suitable. If one tooth is slightly out of position, a veneer can sometimes be fitted to bring it into line with the others. Because they are very thin and are held in place by a special strong bond very little preparation of the tooth is needed. Some types of veneers require no preparation of the tooth at all. Generally, it takes a couple of appointments to prepare and fit a veneer. During the first visit, we’ll prepare the tooth to enable an impression to be taken. After that impression is taken the veneer is custom-made by a specialised lab technician. During your second visit, your dentist will place the veneer on your tooth to make sure you’re happy with the colour, shape and fit. The veneer will then be bonded in place with a special adhesive, which holds it firmly on the tooth.